A nebula is an interstellar cloud of dust, hydrogen gas and plasma. It is the first stage of a star's cycle. Originally nebula was a general name for any extended astronomical object, including galaxies beyond the Milky Way (some examples of the older usage survive; for example, the Andromeda Galaxy was referred to as the Andromeda Nebula before galaxies were discovered by Edwin Hubble). Nebulae often form star-forming regions, such as in the Eagle Nebula. This nebula is depicted in one of NASA's most famous images, the "Pillars of Creation". In these regions the formations of gas, dust and other materials 'clump' together to form larger masses, which attract further matter, and eventually will become big enough to form stars. The remaining materials are then believed to form planets, and other planetary system objects. Many nebulae form from the gravitational collapse of diffuse gas in the interstellar medium or ISM. As the material collapses under its own weight, massive stars may form in the center, and their ultraviolet radiation ionizes the surrounding gas, making it visible at optical wavelengths. An example of this type of nebula is the Rosette Nebula or the Pelican Nebula. The size of these nebulae, known as HII regions, varies depending on the size of the original cloud of gas, and the number of stars formed can vary too. As the sites of star formation, the formed stars are sometimes known as a young, loose cluster. Some nebulae are formed as the result of supernova explosions, the death throes of massive, short-lived stars. The material thrown off from the supernova explosion is ionized by the supernova remnant. One of the best examples of this is the Crab Nebula, in Taurus. It is the result of a recorded supernova, SN 1054, in the year 1054 and at the centre of the nebula is a neutron star, created during the explosion. 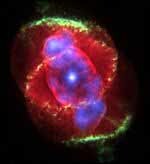 Other nebulae may form as planetary nebulae. This is the final stage of a low-mass star's life, like Earth's Sun. Stars with a mass up to 8-10 solar masses evolve into red giants and slowly lose their outer layers during pulsations in their atmospheres. When a star has lost a sufficient amount of material, its temperature increases and the ultraviolet radiation it emits is capable of ionizing the surrounding nebula that it has thrown off. Reflection Nebula In Astronomy, reflection nebulae are clouds of dust which are simply reflecting the light of a nearby star or stars. The energy from the nearby star, or stars, is insufficient to ionize the gas of the nebula to create an emission nebulae, but is enough to give sufficient scattering to make the dust visible. Thus, the frequency spectrum shown by reflection nebulae is similar to that of the illuminating stars. Among the microscopic particles responsible for the scattering are carbon compounds (e. g. diamond dust) and compounds of other elements such as iron and nickel. The latter two are often aligned with the galactic magnetic field and cause the scattered light to be slightly polarized (Kaler, 1998). Edwin Hubble distinguished between the emission and reflection nebulae in 1922. Reflection nebulae are usually blue because the scattering is more efficient for blue light than red (this is the same scattering process that gives us blue skies and red sunsets). Most nebulae can be described as diffuse nebulae, which means that they are extended and contain no well-defined boundaries. In astronomy, diffuse nebulae is the general term for illuminated nebulae. The three types of diffuse nebulae are reflection nebulae, emission nebulae and supernova remnants. They are diffuse as opposed to the non-diffuse dark nebulae, i.e. the particles have spread out. In visible light these nebulae may be divided into emission nebulae and reflection nebulae, a categorization that depends on how the light we see is created. Emission nebulae contain ionized gas (mostly ionized hydrogen) that produces spectral line emission. These emission nebulae are often called HII regions; the term "HII" is used in professional astronomy to refer to ionized hydrogen. In contrast to emission nebulae, reflection nebulae do not produce significant amounts of visible light by themselves but instead reflect light from nearby stars. 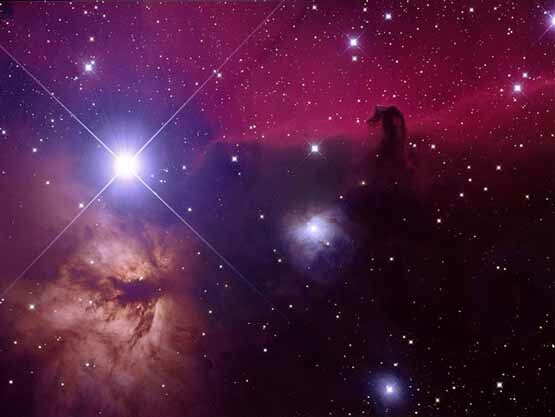 The Horsehead Nebula, an example of a dark nebula. Dark nebulae are similar to diffuse nebulae, but they are not seen by their emitted or reflected light. 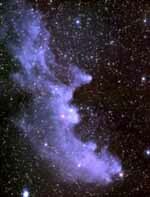 Instead, they are seen as dark clouds in front of more distant stars or in front of emission nebulae. Although these nebulae appear different at optical wavelengths, they all appear to be bright sources of emission at infrared wavelengths. This emission comes primarily from the dust within the nebulae. Planetary nebulae are nebulae that form from the gaseous shells that are ejected from low-mass asymptotic giant branch stars when they transform into white dwarfs. These nebulae are emission nebulae with spectral emission that is similar to the emission nebulae found in star formation regions. Technically, they are a type of HII region because the majority of hydrogen will be ionised. However, planetary nebulae are denser and more compact than the emission nebulae in star formation regions. Planetary nebulae are so called because the first astronomers who observed these objects thought that the nebulae resembled the disks of planets, although they are not at all related to planets. A protoplanetary nebula (PPN) is an astronomical object which is at the short-lived episode during a star's rapid stellar evolution between the late asymptotic giant branch (LAGB) phase and the subsequent planetary nebula (PN) phase. A PPN emits strong in infrared radiation, and is a kind of reflection nebula. The exact point when a PPN becomes a planetary nebula (PN) is defined by the temperature of the central star. Emission nebulae are clouds of high temperature gas. The atoms in the cloud are energized by ultraviolet light from a nearby star and emit radiation as they fall back into lower energy states (in much the same way as a neon light). These nebulae are usually red because the predominant emission line of hydrogen happens to be red (other colors are produced by other atoms, but hydrogen is by far the most abundant). Emission nebulae are usually the sites of recent and ongoing star formation. Reflection nebulae are clouds of dust which are simply reflecting the light of a nearby star or stars. Reflection nebulae are also usually sites of star formation. They are usually blue because the scattering is more efficient for blue light. Reflection nebulae and emission nebulae are often seen together and are sometimes both referred to as diffuse nebulae. Dark nebulae are clouds of dust which are simply blocking the light from whatever is behind. They are physically very similar to reflection nebulae; they look different only because of the geometry of the light source, the cloud and the Earth. Dark nebulae are also often seen in conjunction with reflection and emission nebulae. A typical diffuse nebula is a few hundred light-years across. A supernova occurs when a high-mass star reaches the end of its life. 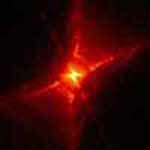 When nuclear fusion ceases in the core of the star, the star collapses inward on itself. The gas falling inward either rebounds or gets so strongly heated that it expands outwards from the core, thus causing the star to explode. The expanding shell of gas form a supernova remnant, a special type of diffuse nebula. Although much of the optical and X-ray emission from supernova remnants originates from ionized gas, a substantial amount of the radio emission is a form of non-thermal emission called synchrotron emission. This emission originates from high-velocity and electrons oscillating within magnetic fields.